Fantastic short novella from the master of hard SF. I'm particularly happy with this because I finally have a short Egan work to suggest people start with; it's light enough for people to get their toes wet, but still rich in Egan-y big ideas. This reads a lot like the "lite" version of The Clockwork Rocket: interesting aliens, entire civilization threatened, find a solution using science & the peculiarities of their world. Egan does a good job of getting the characters comfie in your head as just people before their (extreme) biological differences become apparent. If you find the phrase "ice-world xenobiology" enticing, look no further! Here's your book. Twin Europa/Enceladus-like planets with intelligent, modest-tech-level inhabitants who have to figure out how to move between the two. Great fun. 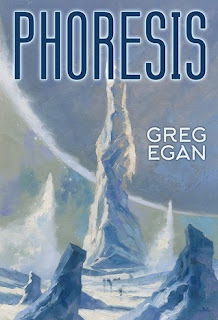 Phoresis feels like a spiritual successor to Hal Clement's short SF novels--Mission of Gravity and the like. Fun aliens, big-but-graspable astronomical ideas. Character and plot are not super-deep here, but the scientific premises are enjoyable enough to carry you through. And, I can't help thinking, this style of story--bold, takes existential crises seriously, uses both engineering and social movements to forge a better future--is a welcome strain of science fiction alongside climate disaster fiction & fact.